At the end of the 60s, ‘anti-psychiatrist’ R D Laing’s ideas about the family as an oppressive institution causing untold psychological damage to its members started to filter down into popular culture. Makers of horror films took them up with particular aplomb, and in the 70s unhealthy family relationships become as much of a horror cliché as fog-shrouded graveyards were in previous decades. They’re at the centre of some of the most interesting British horrors of the time, including Mumsy, Nanny, Sonny and Girly; Goodbye Gemini; Demons of the Mind; The Creeping Flesh; Frightmare – and this little curio. An arty, small-scale project, it was the brainchild of director Viktors Ritelis and actor Olaf Pooley, who wrote it and also pops up as a suspicious neighbour. The film’s original title was The Corpse. That’s a creepy and appropriate enough title but in their infinite wisdom the film’s American distributors retitled it Crucible of Horror (“crucible” is one of those words that sounds good in a horror film title even if it doesn’t have much to do with the film: see also the Mike Raven extravaganza Crucible of Terror – although that was called Unholy Terror in the US). Michael Gough gives a pretty restrained performance (by his standards) as domestic tyrant Walter Eastwood. The first indication we get that his relationship with his teenage daughter Jane (Sharon Gurney) is a bit out of the ordinary is the sight of him furtively squeezing her bike seat shortly after she’s dismounted. The second is the sight of him beating her senseless with a riding crop after learning she’s stolen money from the local golf club (and aroused the interest of its lecherous proprietor). Jane gets no sympathy from her brother Rupert, an odious creep who idolises his father despite or because of his general terrorising of the family (and is played by Gough’s real-life son Simon). Mother Edith (Yvonne Mitchell) retreats from her nightmarish home life into her room, where she paints monstrous portraits of Walter. The family’s strained dinner table conversation, full of subtle putdowns that wouldn’t be out of place in an Ivy Compton-Burnett novel, makes for uneasy viewing. “Oh God,” says Rupert, on realising he’s forgotten to buy a canvas for his mother. “I hardly think He would be interested”, Edith replies with subtle self-pity. Her face perfectly communicating a lifetime of disappointment, Mitchell’s brilliant performance is the heart of the film: Edith’s faraway manner conceals a burning hatred for her husband that quietly comes to a head after the assault on Jane. “Let’s kill him,” she says to her daughter at breakfast the morning after, and it’s her lack of emotion that makes it such a heartrending moment. Edith and Jane follow Walter on a shooting weekend at the family’s country retreat, where Edith shoots her husband after explaining she’s been inspired by reading the Marquis de Sade in an effort to understand how his mind works: “it’s full of the most unutterable filth, but it opened a few windows for me”. Walter’s fear of his impending death is outweighed by his sheer outrage that his wife would dare handle one of his firearms. The women’s efforts to make the death look like an accident afford us the sight of a half-naked Michael Gough, something perhaps few people have ever wanted to see. But Walter proves no easier to handle in death than he did in life, his body disappearing and reappearing in disturbing fashion, leading to a creepy and entirely inexplicable conclusion. Meanwhile, Edith’s decaying mental state’s conveyed to us through the kind of psychedelic dream sequence that’s always a highlight of films from this era. This probably isn’t everyone’s idea of a classic horror film: anyone drawn in by the title and John Hotchkis’s utterly generic horror music (it sounds more like the theme to Dark Shadows than anything else) might be driven up the wall by the self-conscious artiness, the many talky scenes and the lack of any especially gruesome moments, let alone the lack of explanation for the strange goings-on. But it’s a disturbingly pessimistic portrait of middle-class family life as an inescapable prison, with a steadily mounting atmosphere of dread. The current US DVD release of Crucible of Horror has absolutely diabolical picture quality, and the sound’s no better. If ever an obscure British film deserved to be given a brush-up by the BFI’s Flipside department it’s this one. 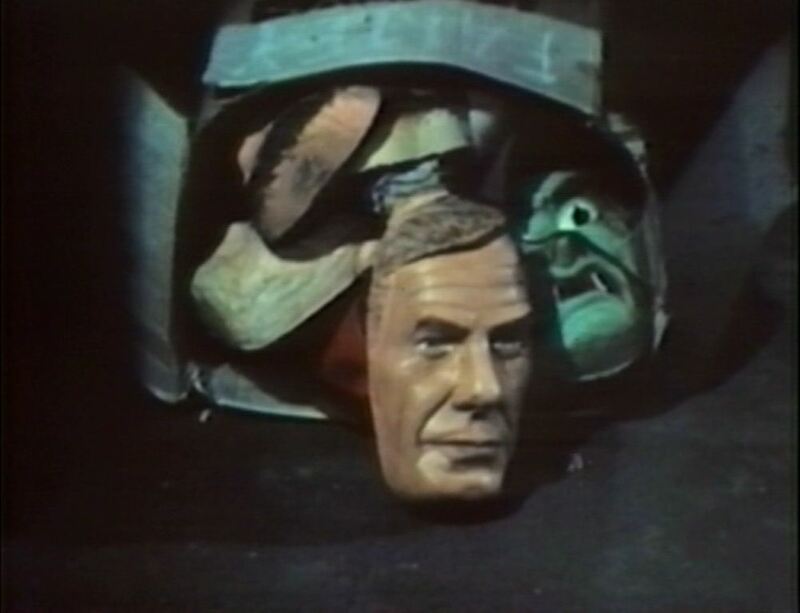 Yes – it’s a Michael Gough mask! Why these aren’t readily available in the shops is beyond me: I don’t know about you but I now want one of these more than anything else on Earth.